Hawai’i Montessori School is an independent, non-denominational NAEYC accredited school located on the beautiful Big Island of Hawai’i. We provide caring, safe, child-centered environments, challenging and developmentally appropriate programs, and a supportive school community for children from ages 15 months to 6 years old. We offer a variety of full and part time programs, and we provide generous financial aid to qualified applicants to ensure our goal of an economically diverse student population. Hawai’i Montessori School offers carefully planned, stimulating environments for learning. The curriculum covers a broad range of topics, including social skills, social and natural sciences, language, math and the arts. 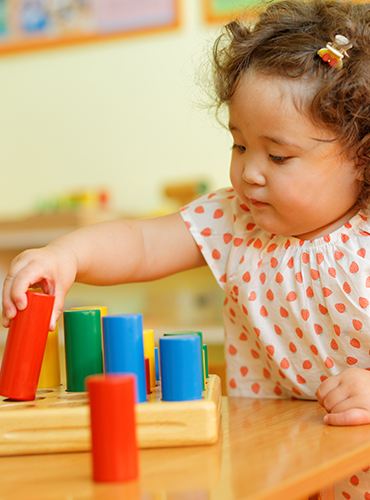 We use Montessori materials that are designed to provide specific learning experiences, and that meet the unique needs of children at each stage of their development. We are now accepting applications for the current semester. In a Montessori class, children engage in interactive learning in an environment carefully prepared by an educator trained to work with children of specific age groups. In classes of mixed ages, children are given lessons by the teacher. They are then able to make discoveries about language, mathematics, geography, geometry, art and music. The highly social atmosphere of this environment stems from a unique combination of freedom and structure founded on respect. A Montessori education fosters the fullest development of a child’s potential and provides a foundation for a life of joyful and successful learning. Our programs focus on the children, not the teacher. Our classrooms are carefully prepared to encourage each child to actively participate in his/her learning experience. Our teachers complete an extensive training program in order to be able to meet the individual needs of each child. Our primary consideration is your child’s safety. Your child will feel safe and comfortable in his/her class. Hawai'i Montessori School offers a variety of part and full time programs. We also have extended afternoon care. Voted best preschool for four years in a row. Mahalo nui loa to the community!